Warming trends near the end of February resulted in a dramatic improvement in consistency this month. While early in the month there were some days that were challenging, things began to settle into the spring pattern after 80 degree temperatures near the end of the month. 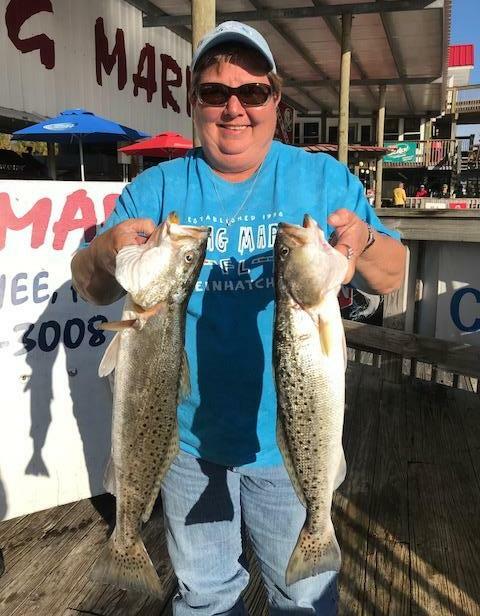 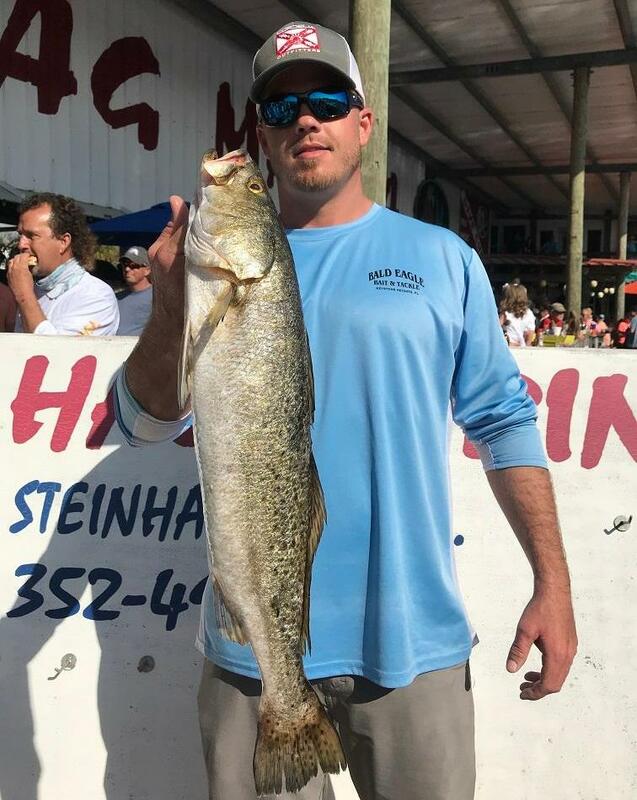 There were some really large trout and more consistent redfish taken, and the first tournament of the season, held in conjunction with the Fiddler Crab Festival, was a great success. 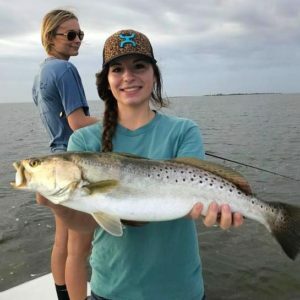 Fishing spots that were productive near the end of the month included areas outside of Pepperfish Keys, flats outside of Hardy Point, the Sink Creek area (all to the south) and to the north, the flats outside of Dallus and Clay Creek. 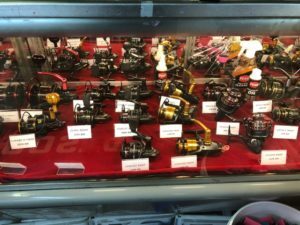 Water temperatures are now high enough so that fish are slamming topwater plugs. 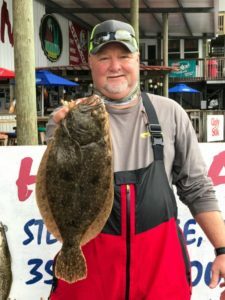 In sandy areas there have continued to be some excellent flounder action. 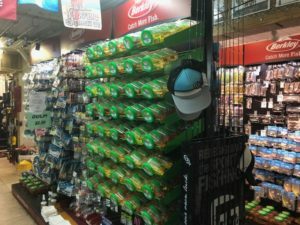 Here are some pictures from this past month. 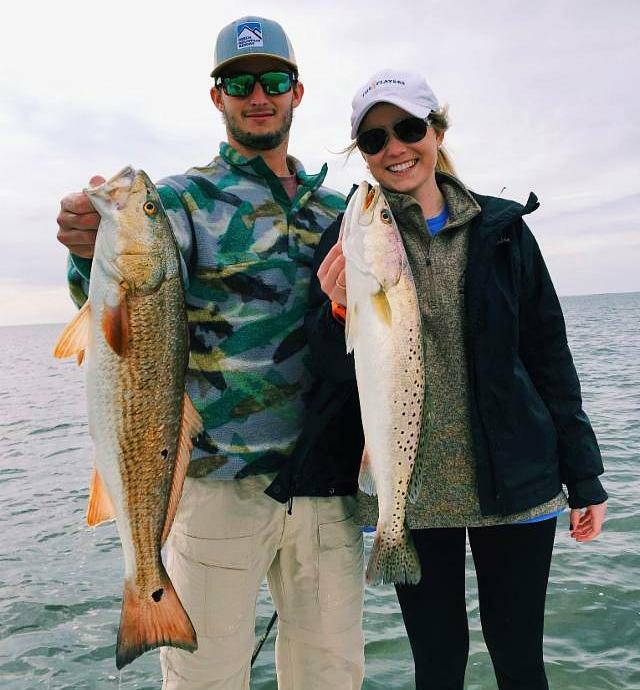 Caroline Buchanan and Ryan Fisher with a fine redfish/trout combination. 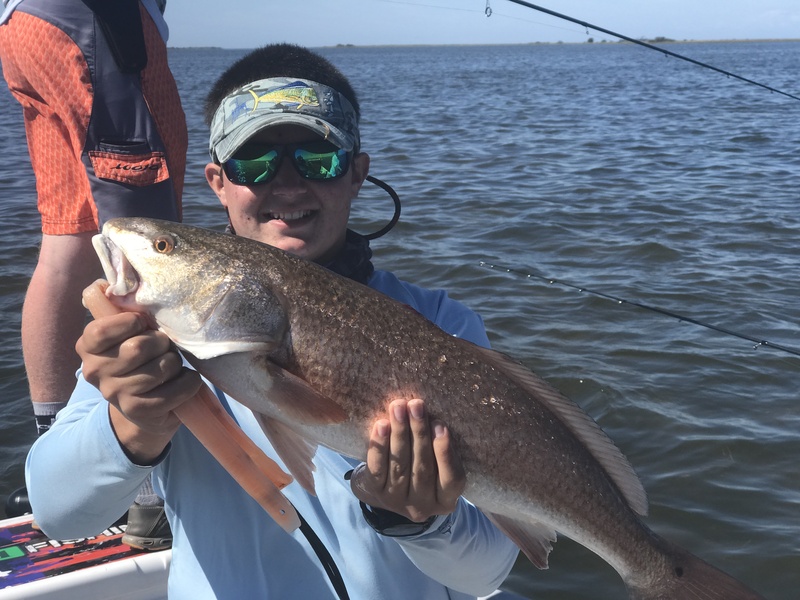 Elliot McDavid found a large trout honey hole…..
Cameron Adams with the first place trout in the Fiddler Crab Festival Tournament. 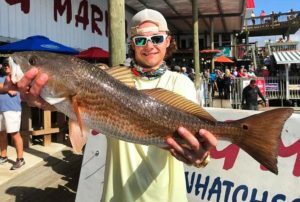 …and Chad House took first place redfish with this 6.75 pounder. 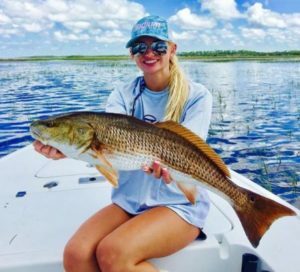 Shelby Bullock from Horseshoe Beach with a beautiful slot redfish. Russ Hinds came all the way from Nebraska to catch some Big Bend trout. 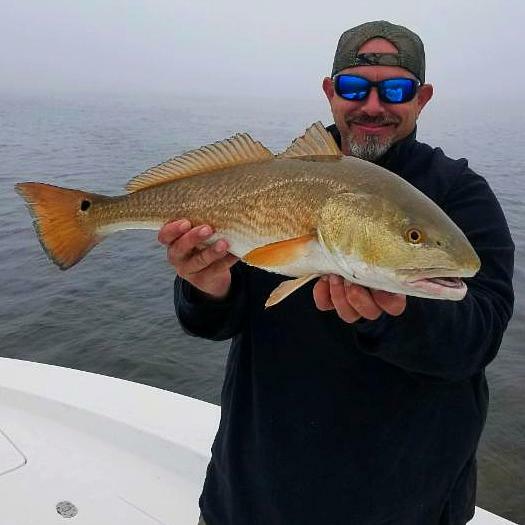 Mike Kelly with a upper-slot redfish on a foggy day. 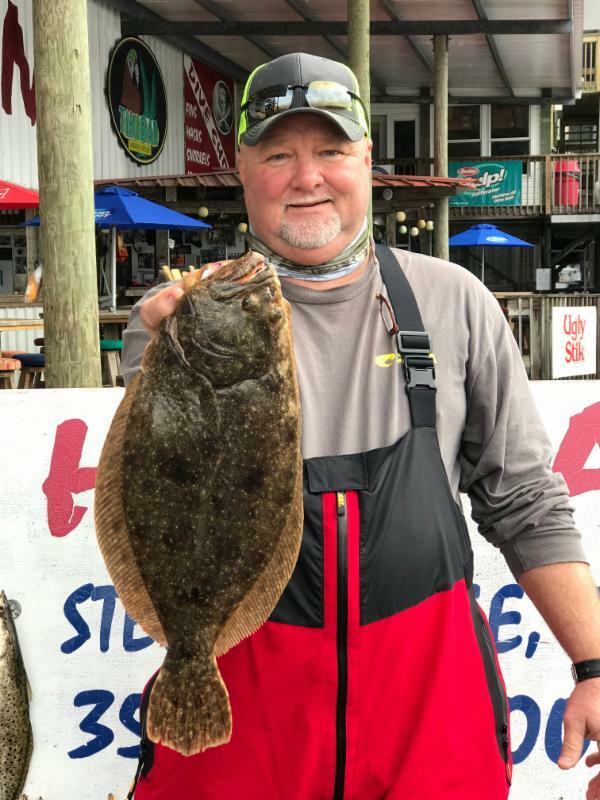 Ken Sheffield from Eastman, Ga. with an eating-sized flounder. 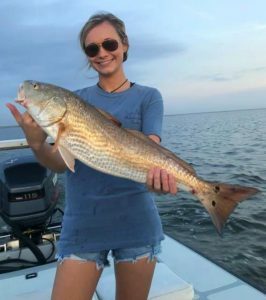 Littlest Sea Hag Chaeli Norwood with a shallow-water redfish. Emily Ellison from Cross City with a fat upper-slot trout. Cindy Graham from Steinhatchee has inside information on where the trout are. 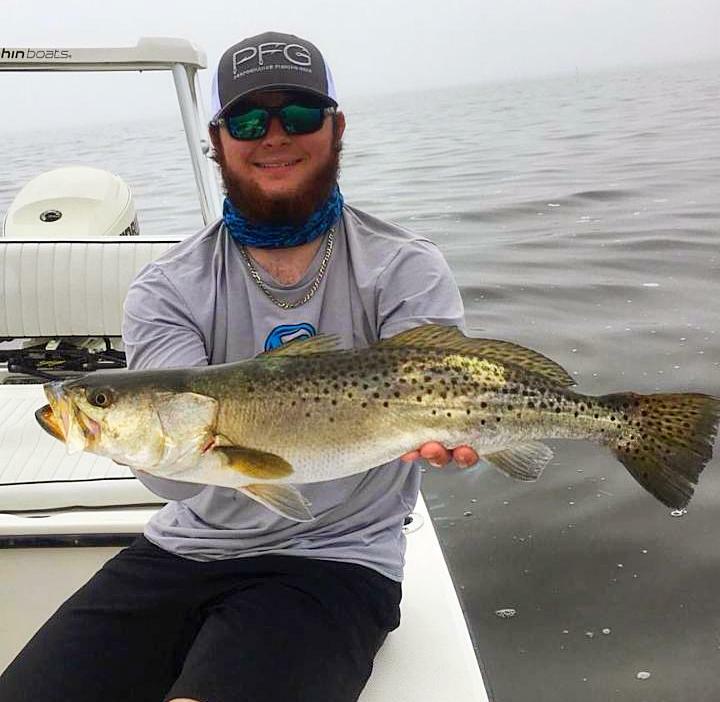 Joey Landreneau, lure-maker from Gainesville, found this 27.5 inch trout south of Keaton Beach. 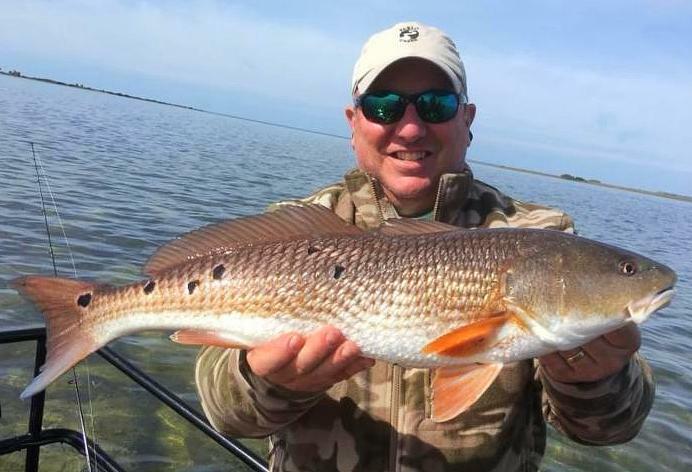 Scott Hudson with an excellent redfish. 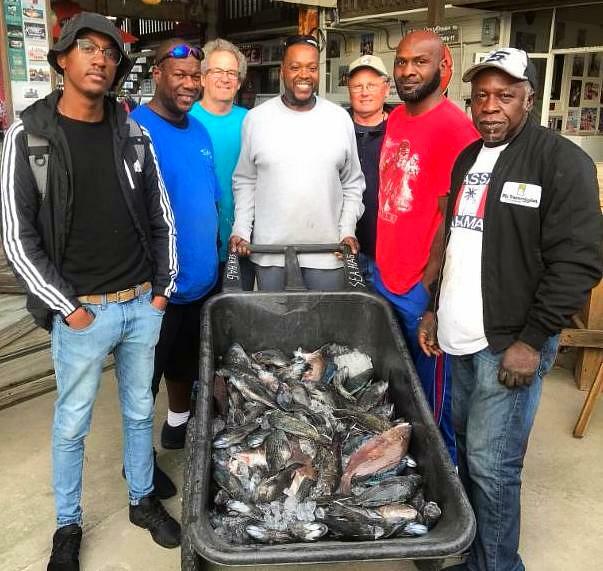 Charles Griggs Junior and Senior, James Knott, and Scott Watkins came down from Douglasville, Ga. for a bottom-fishing trip and took back plenty of fillets. Don Sloan and Pat Tullo from Valdosta found some keeper trout on the flats. 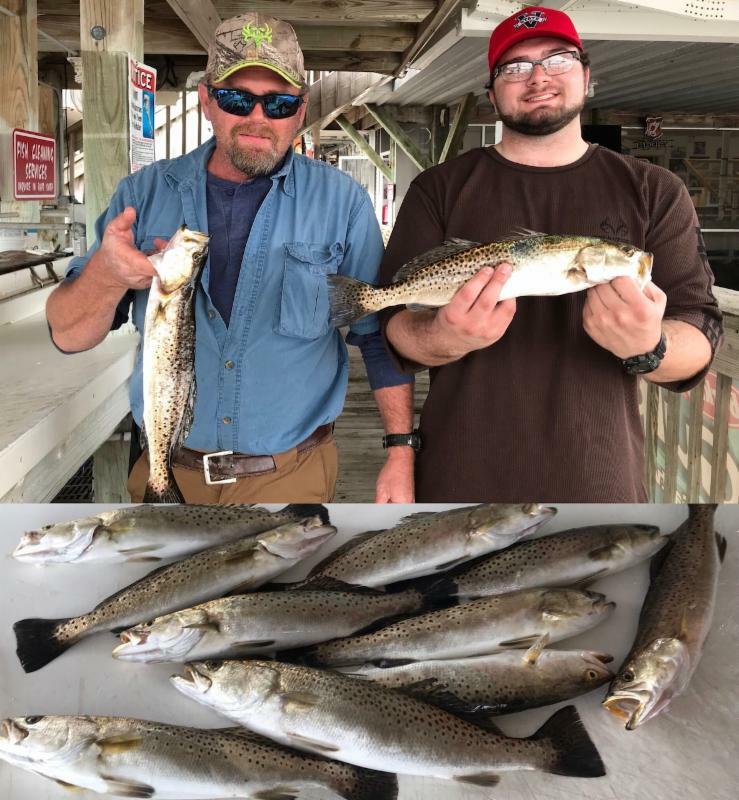 Leland Roberts and Jason Gamage from Tifton, Ga. had a great time catching trout. 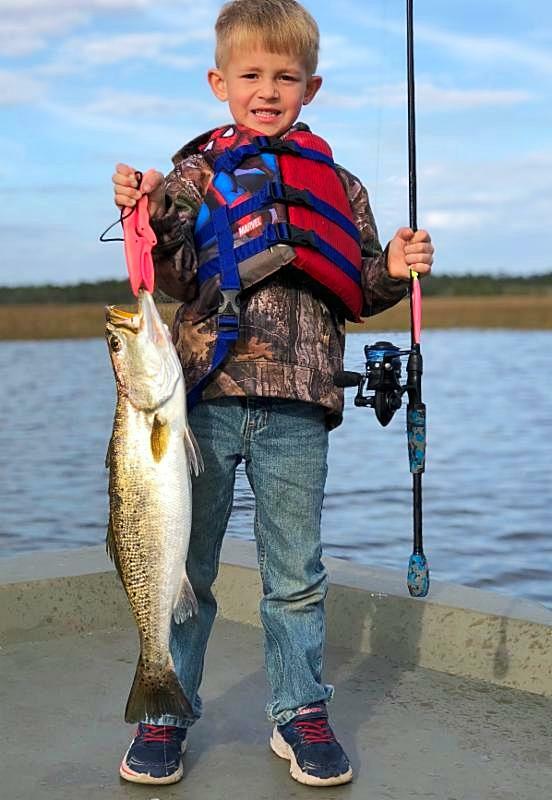 Looking ahead, the first big sheepshead catch has arrived, courtesy of Rylan, Ragen, Ted and Reece Bozeman, and Mike Bennet from Norman Park, Ga.
Colby Snyder caught this trout all by himself. 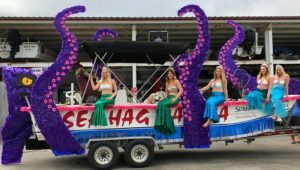 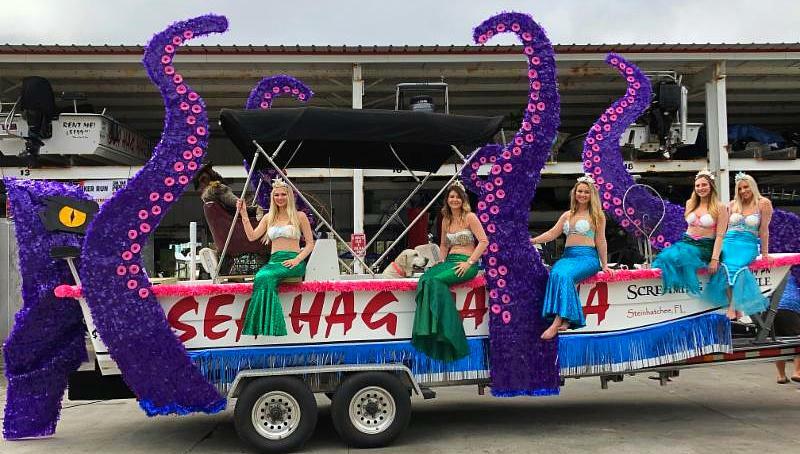 The Sea Hag mermaids rode their float to another victory in the Fiddler Crab Festival contest. Congrats! Things will only get even better this month with rising water temperatures. Redfish are already schooling close to shore and are taking topwater and suspending plugs as well as jigs and soft tails. Flooded oyster bars and marshes on higher tides have given up good solitary fish. 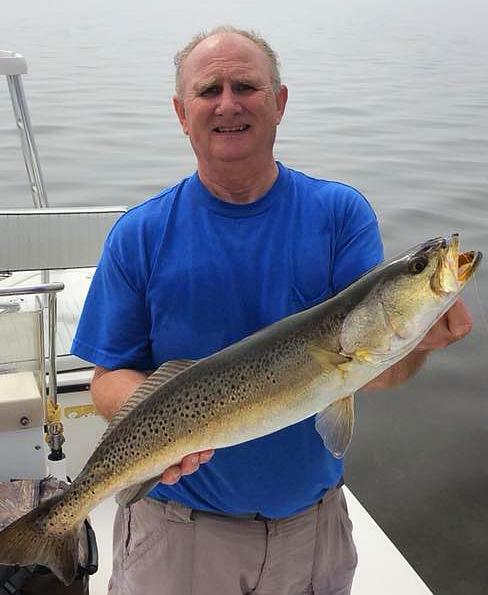 Larger trout have been taken in slightly deeper water and have been eating lures as well as Gulp baits under popping corks. 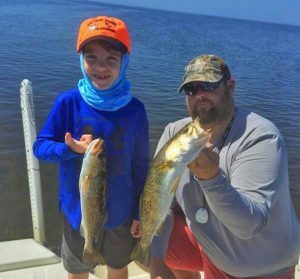 We can expect cobia to start to arrive on nearshore structure; watch for them cruising the flats as well. 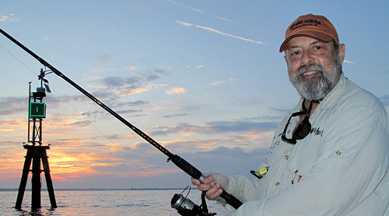 Offshore, amberjack, gag grouper and red snapper seasons are closed, but there are still kingfish migrating southward. 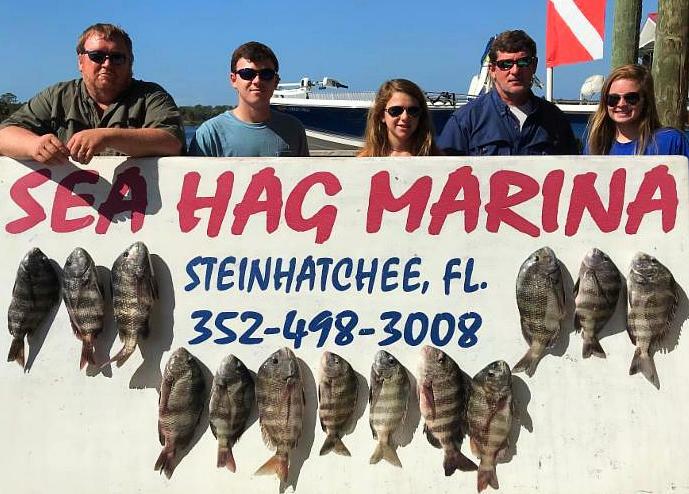 One definite positive is that we can expect an early arrival of sheepshead on nearshore rock piles and other structure, since some have already been caught. Fiddler crabs and live shrimp are the go-to baits for sheepshead, and an easy place to start is the Steinhatchee Reef, directly west of Marker 1 about nine miles offshore. 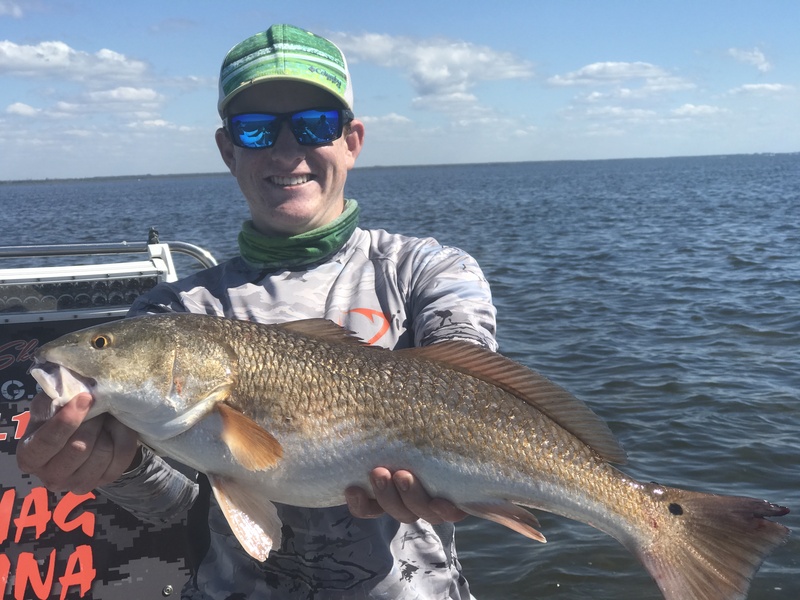 Remember the bag limit is 15 fish over 12” per person, and there are concerns over the health of the local fishery, so please stick to the limits. 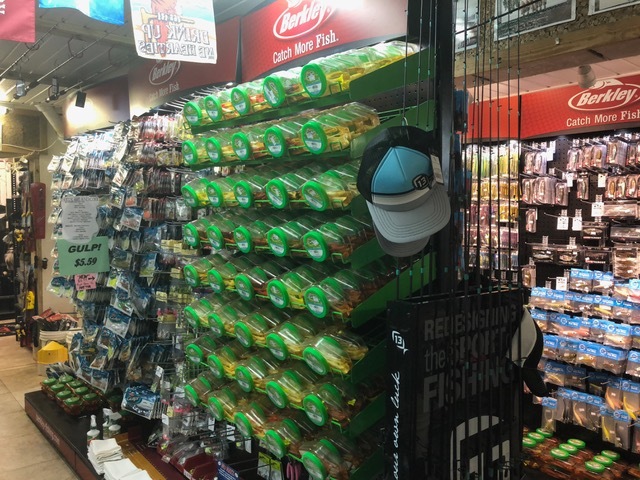 It’s going to be a great month to fish, and remember we have rods, reels, tackle, lures and live bait….everything you need, including rental boats, so come see us and catch some fish. 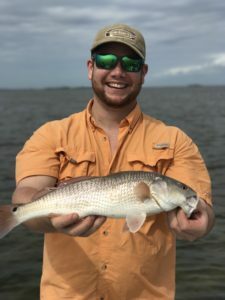 Water temperatures are quickly increasing and the activity on the flats is doing the same. The redfish bite has been fairly consistent and the trout are absolutely on fire. 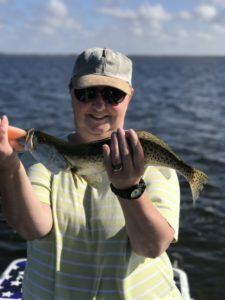 The weather has been nice and the sun has been shining. 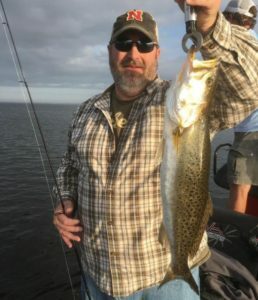 I still have plenty of available charters this month and as usual would love to show you around. 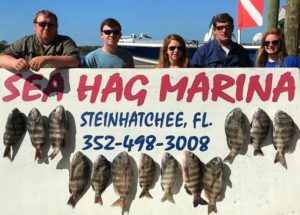 Scallop charters are starting to book up quickly so don’t wait until last minute. 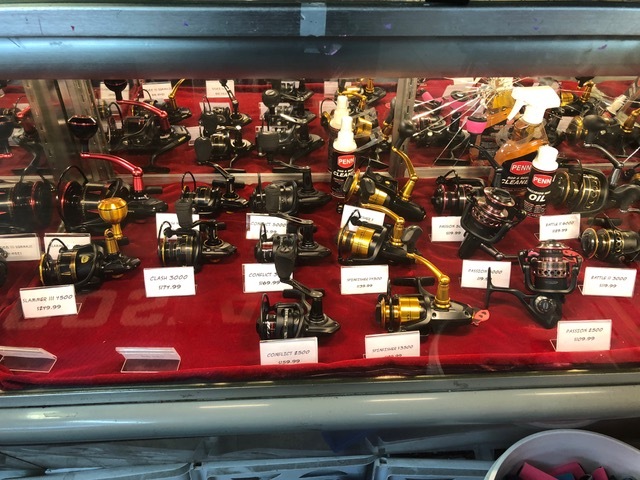 God Bless and tight lines!